So there I am, dropping from a plane at terminal velocity, hands clenched as the icy ground screams towards my face, and it’s just another case of so far, so battle royale. We’ve all been through this so many times that if any of us ever did have to parachute into a warzone we’d probably start scrolling through Twitter on the way down. It’s ruined skydiving for a generation. So what does Battlefield V’s new battle royale mode, Firestorm, do about it? Well, nothing when it comes to the all-too-familiar drop, but otherwise quite a lot. That’s the reason it’s taken this long to launch – four months and 16 days since Battlefield V’s November release date, to be precise. Developer Criterion wanted to get it right, and from a purely technical point, it has. Firestorm is a marvel. We’ve got 64 players here, all fighting across the biggest map in Battlefield V history – Halovy is ten times the size of previous title holder Hamada – without much of a compromise to visual quality. 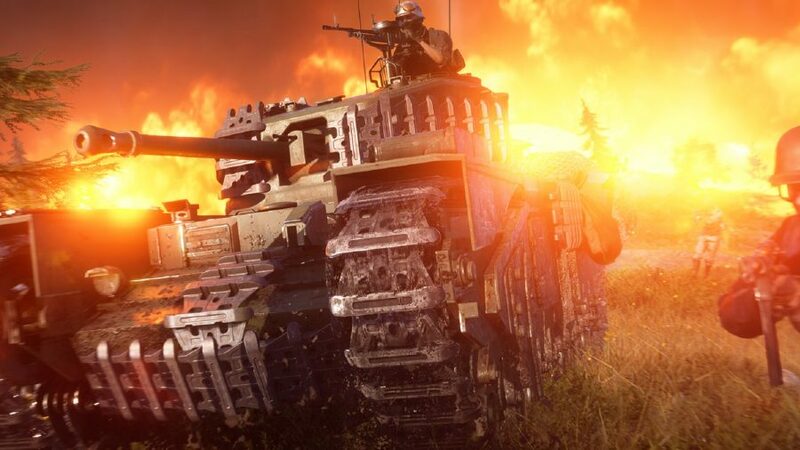 In fact, the environmental destruction is actually better than anything I’ve seen before from Battlefield V.
“We had to play with some of the values, technically,” Criterion producer Arthur Rohard tells us. “To present it simply, we moved the destruction meter up a bit. There’s a fragile element to buildings.” That’s putting it lightly. Take my first encounter. I climb a loft and spot a squad of four from the window. Turns out they spotted me first and spray shots at the window. I go prone and keep my sights on the stairs. The next thing I know, the front of the house is gone and my ears are ringing. Seconds later, another rocket chomps through what remains of the roof, causing the floor to give way and plunging me down to the ground. The collateral damage here is unlike any other battle royale game. The ring of fire that slowly encloses the battleground is also tremendously realised. Carving through wooden houses and leaving charred panels in its wake, the 50ft-high flaming wall is a looming fixture on the horizon – there’s little chance of forgetting to flee when the zone starts shrinking. As well as supreme destruction and gorgeous graphics, Firestorm finds a way to bring over two more elements the series is known for: teamwork and vehicles. These converge in ‘vehicle breakouts’. Here, two players team up to turn handles and open a pair of metal doors. Inside is a rare vehicle – a tank, for example. The risk is that it takes about 20 seconds to open, and there’s an alarm going off the whole time to alert other players. Conquest mode makes a cameo, too. Come across a supply point and you can secure it for higher quality loot. Or, if you’re crafty, wait just outside of the zone for others to capture it, then gun them down. Indeed, as you’d expect from Battlefield, there’s an emphasis on teamwork. You can issue waypoints and highlight hostiles with a ping system, and revive teammates when they’re shot down. Criterion will patch in solo play further down the line. 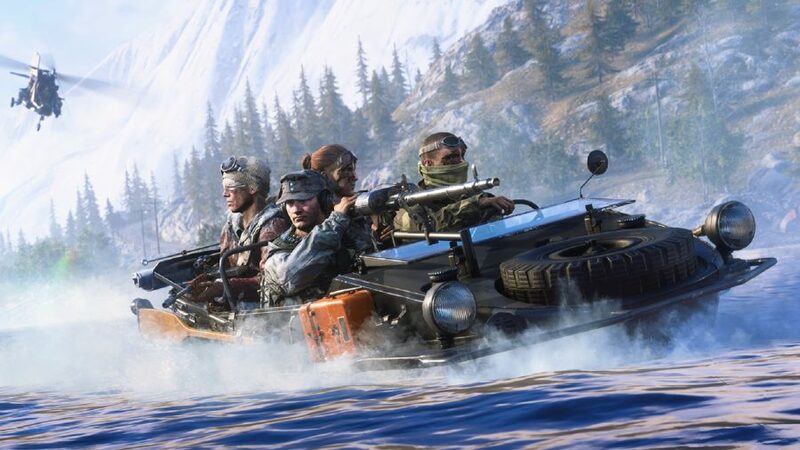 There’ll be new vehicles and customisation options too, and Rohart even hints at a persistent story: “I would say that one thing we do differently is the stories being told through the world. As you explore you will see things changing. There’s a story that’s going to unfold over time.” This all makes Firestorm an effective stab at a crowded genre. Ten-hut! Play the best war games on PC, now soldier! With its immense destruction, teamplay focus, and optional objectives, Firestorm is battle royale done right. It’s unlikely to set the genre alight given the steep competition and asking price, but Criterion has successfully hammered Battlefield V into an enticing battle royale shape while introducing some refreshing new ideas.